If you are a fairly regular reader, you know that I’ve run quite a lot of races this year (20 in fact). With that, I’ve run six marathons in the past two years. It seems crazy to me that I’ve racked up so many marathons in a relatively short time frame, but I have. I’ve learned so much from each marathon, and I know I’ll continue to learn and grow with each one I run. 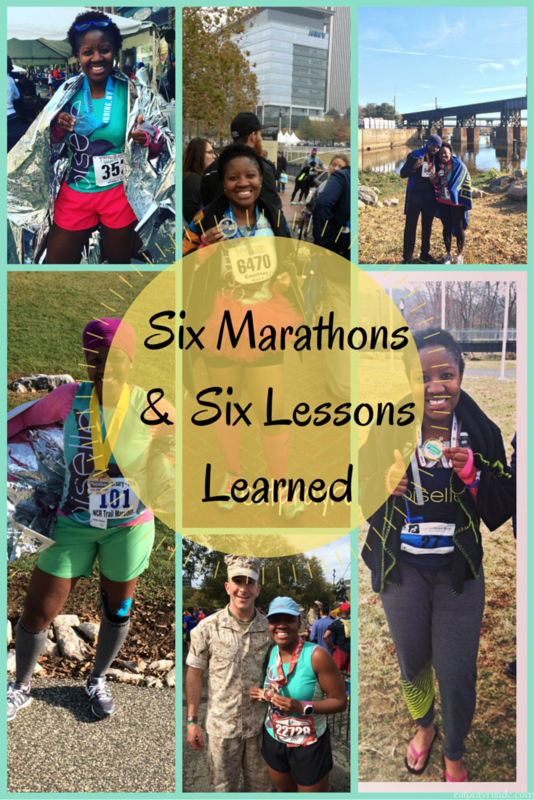 I thought I’d share six lessons from six marathons – can any of you relate to these? Marathons can be addictive. See above. The thing about the marathon that gets me is that it’s easy to think, “Oh wow, if I just pick up the pace a tiny bit (say 30 seconds per mile) then that’s a huge PR.” That’s how you end up running six marathons in two years. Don’t say I didn’t warn you. Your body can do incredible things. It still amazes me every time I cross a marathon finish line and I know that feeling of awe will never go away. It’s truly an accomplishment, testament and reminder of the strength we possess. Meaning, we (all runners—at whatever distance and pace) are all kinda badass. Take care of your body. That being said, you should treat your body right as it runs crazy distances! I’ve started getting massages from my physical therapist office after each marathon. I wait a few days and I’m gonna be honest it HURTS (A LOT), but it makes my muscles feel better afterwards. I also make sure to take a few days (at least) of complete rest. My body deserves it. Running more = running faster. I’m going to say straight out that this is COMPLETELY my opinion. I know people who can get crazy fast while running lower mileage. I kind of wanted to be that person (hence when I tried Run Less, Run Faster), but I am not. This past training season, I ran more mileage than I ever have and I set personal records in multiple distances (the 10k, the 10-miler, the half marathon and the marathon). I am confident that those PRs are in large part due to the fact that I ran more miles. Pick your poison when deciding when to train. Fall races = training through summer heat and spring races = training through winter snow and ice. I have done both and it’s absolutely a matter of personal preference. Personally, I’d rather train during the summer for a marathon than have to run 20 miles during a snow storm. But that’s just me. Running marathons does not give you carte blanche to eat ALL THE THINGS. Ah, yes. Many people think that I can just eat whatever I want because I run marathons. Sadly (SO very sadly) that is NOT true. In fact, if I eat a bunch of junk, it makes running much harder. And the fact is, it is extremely difficult to outrun a bad diet. Yes, I don’t sweat the occasional donut or two. But I don’t eat pepperoni pizza every day, no matter how much I’d like to! What have you learned from your favorite race distance? Don’t forget my Year in Running Linkup is LIVE! Go answer the questions and link up! A version of this post originally appeared on the Women’s Running website. I’ve trained in both winter and summer. I don’t mind running on the treadmill in each occasion to be honest. You’ve done so well in all of your races and your improvement is incredible. I cannot wait to see what 2016 brings. Thanks Hollie! I’m actually thinking about getting a cheap gym membership this winter (if we ever get winter weather) so my runs won’t be derailed by snow and ice! Oh I agree that marathons can become addictive. I have run 6 in 3 years and have 2 planned in the next 5 months! I am lucky to be the run less, run faster kind of runner, but age also is a factor when you run tons of mileage. My body needs for rest! I definitely prefer to train in the winter, since we have such hot and humid summers here in NC and rarely snow int eh winter. I’m really hoping to run my very first marathon in 2016, but my bf is warning me not to do it, even though he’s run a marathon before! It’s been awesome to see how fast you’ve gotten and it makes sense that more mileage makes the difference. Oh you already know what I’m going to say…DO IT! Duh. Even if you just run one – DO IT! haha, I guess it’s personal when it comes to being addicted to marathons. I’ve only run one and I haven’t gotten that bug to do multiple. Maybe another one is around the corner but I like the half distance right now. But I love your lessons learned here! You’ve done so well this year!! My favorite race distance is the half marathon. I’m taking some time off from it but also learned a lot in the several years of running them. The thing I learned last year is that cross training and being stronger helped me improve my time greatly. Because I was involved with other things I didn’t go the distance in training, but because I was stronger I was able to outperform the previous time. Shalama recently posted…Who is your hero? That’s a great lesson. A stronger body = a better race! I’m always amazed at how much our bodies are capable of. Though I have yet to run a marathon, I never imagined that I’d be able to run a half marathon, and then I proved to myself that I could. And then I never imagined that I’d be able to continue running while pregnant, and look what happened, I ran until I was 32 weeks pregnant. Our bodies are capable of so much more than we think they are. You are so right – if we can get our minds on board, our bodies usually respond! These are great lessons! I agree–I noticed my pace pick up as my mileage was increasing. I’ve only done spring races (March-May) so I’ve trained through 10 degree weather/wind/Polar Vortex (that last one may be a little exaggeration) but overall I don’t mind it. The only time I’ll take it indoors is if there’s ice out. It’s so much harder for me to train during the summer, the humidity makes me cranky! We need to meet up for a run someday! I appreciate all the insight! I’m very curious to see how I like my first full next year. Will I get the bug and want to do more, or will I be one and done? I agree with running more = running faster, but I’d add = running better. I never felt so good, strong, and fit than when I was running my peak weeks on Hansons. You’ve had an amazing year, and I look forward to seeing what’s next on your running journey next year! I’ve trained for half marathons in both summer and winter. I’d rather take the winter because I warm up quickly, but there’s no way to get away from the heat. I think my favorite distance is the 10k, and I start training for one in January. You have had quite the “run” on races the last 2 years! Really impressive! I think your lessons learned can really apply to shorter distances as well especially the eating part. Yes, absolutely. They translate to any distance, really! I am preparing my first marathon, just finished week 10 of training. I loved your post because it completely resonates ! Thanks for sharing. When is your next marathon ? Great advice. I cannot wait to get back to full marathons. It is so completely impressive you ran so much this year. I am working on a blog post about my 6 half marathons too. I wish I could say I got a PR but at least I had a blast. PRs are nice, but having fun is way more important!! Would you mind sharing your weekly mileage? Or rather, what your “sweet spot” is in terms of weekly mileage? I’m training for my first marathon using Galloway’s 4/1 run – walk plan. I just ran 17 miles this past weekend and have had anxiety ever since. Galloway’s plan goes up to the full 26 miles a few weeks before race day. Do you think one actually needs to run that far while training or is it more for the mind? Also, any suggestions for fueling and hydrating? How often? Thanks! Hey Heather, I’ve actually written a couple of posts on this – see here and here. Hope this helps! It’s not for everyone but it works for me! Yep, I used to think the same as well. It’s a good lesson to learn and really makes sense when you look at elites and their schedules! Great insight. I agree about the food part-everyone thinks I can eat whatever because I “run all the time” but SO SO SO SADLY it’s not true. I totally agree with the massage part too-I get them before a big marathon as well! I prefer to run in the summer. I know it sounds crazy but living in New England and the way that the winters have been in the past few years makes it extra hard just to get out the door and to be safe. Not crazy at all. There are costs and benefits from both! Great tips! (as always). Ugh I always tell myself I want to train through the winter, but I just really don’t like the cold. Once it gets icy I really get nervous about slipping and breaking something so my motivation kinda plummets. Fall marathons it is for a while I suppose! I agree – I think training for a spring full is really hard but with shorter long runs, training for a half is much more palatable for me!